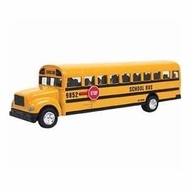 Large die-cast school bus measures 8-1/2 inches long. Working stop sign and swinging doors. Pull-back action. Ages 3+.